Impress friends and office mates with a jaw-dropping, super futuristic, straight out of Hollywood Mac setup. 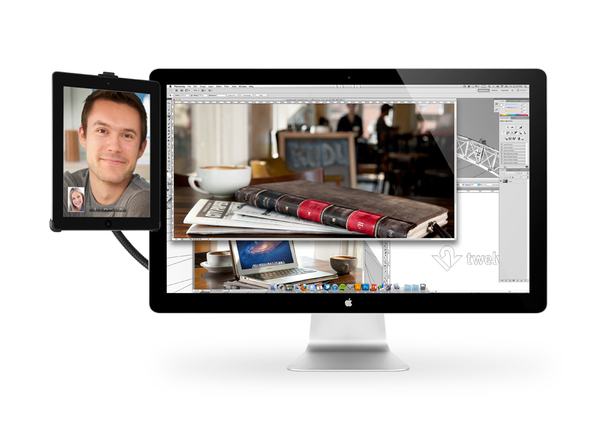 HoverBar hangs iPad beside your Mac, letting you use iPad as a secondary, touchscreen computer. 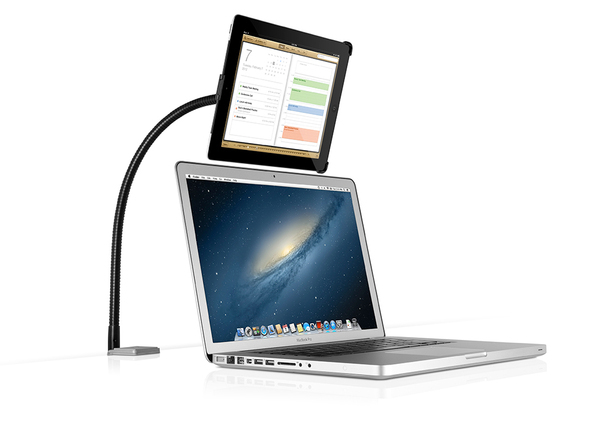 The flexible HoverBar arm positions iPad in a place where you can keep tabs on Twitter, stocks or partake in a FaceTime chat. As a bonus, you can use HoverBar separately to float iPad as a micro workstation, a handy kitchen mount or as a tool that elevates iPad, creating a whole new way to interact with apps. iPad becomes wingman for your Mac. 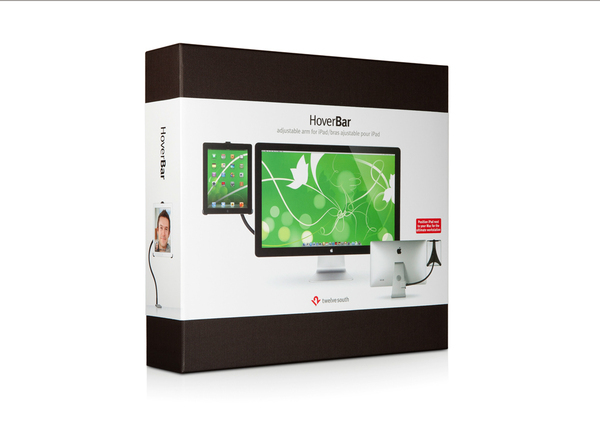 HoverBar connects iPad to your Mac, creating a dynamic duo. 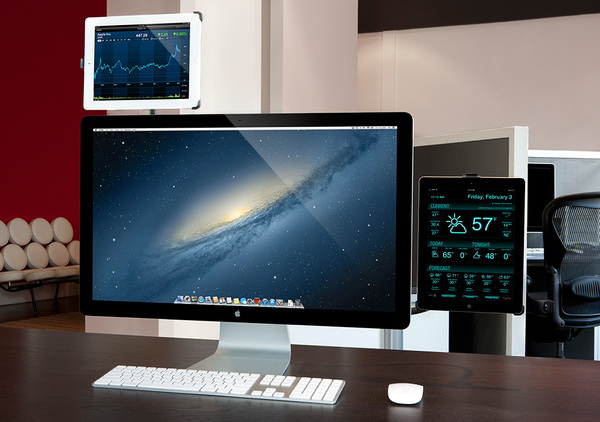 An awesome, Tony Stark - inspired, desktop workstation with a beautiful Apple display and a killer touchscreen computer hanging by its side. HoverBar presents more ways to use iPad more often. Collaborate on a project with FaceTime, monitor the weather and interact with your favorite apps. 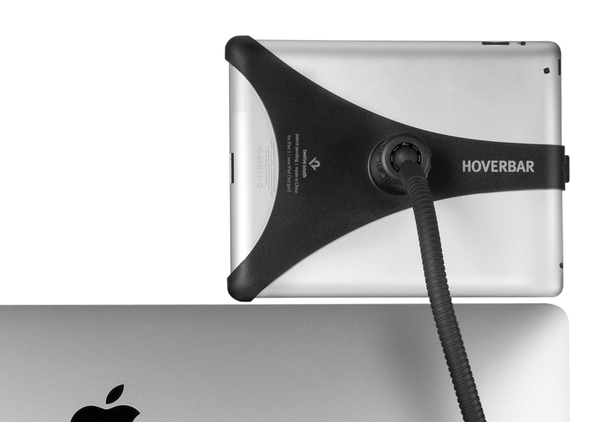 HoverBar rescues iPad from the computer bag. One strong arm. Or two. 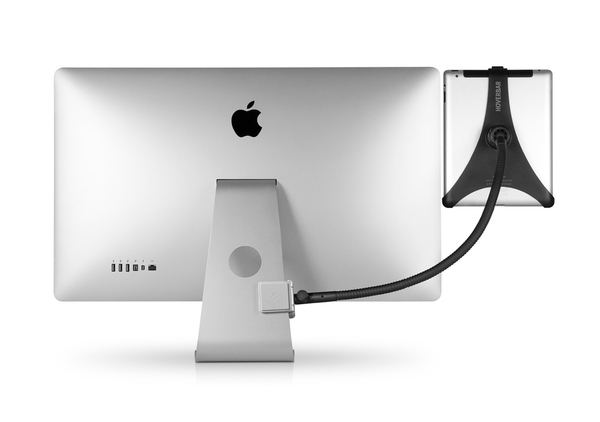 HoverBar floats iPad next to any iMac or Apple display with an L-shaped stand. 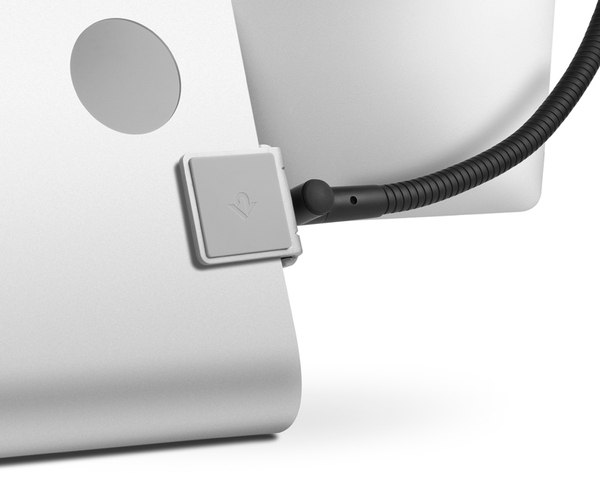 The sleek black, flexible arm on HoverBar connects to your Mac using a sturdy, silicone-lined clamp that leaves no trace. 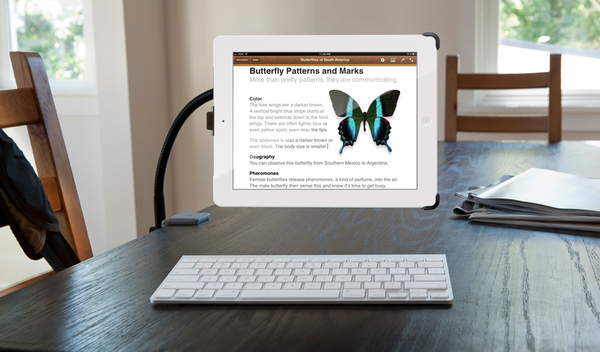 HoverBar has enough muscle and reach to position iPad above or beside any size Mac. 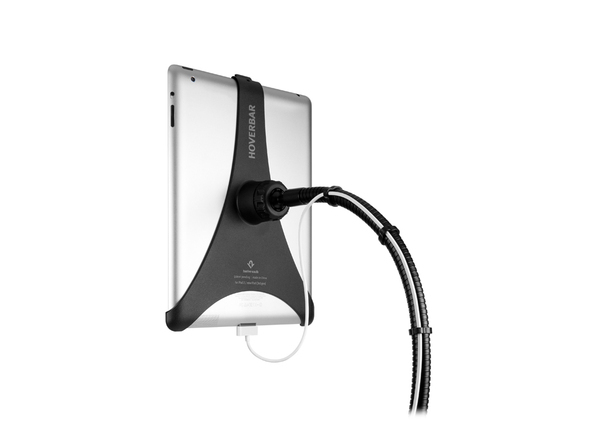 Flex the bar and tilt iPad in any direction to find your favorite viewing position. 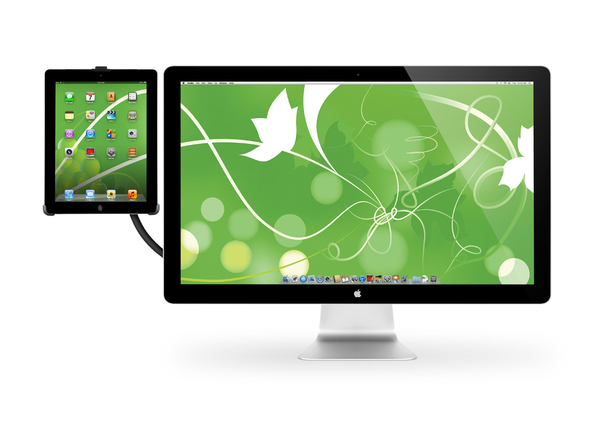 What could be better than one iPad hovering above your Mac? Having a second floating beside it. Floats like a butterfly in the kitchen. HoverBar is a sweet accessory in the kitchen. It connects to a cabinet quickly and easily with a simple clamp. No drilling holes or putting screws into your expensive Cherry cabinets. 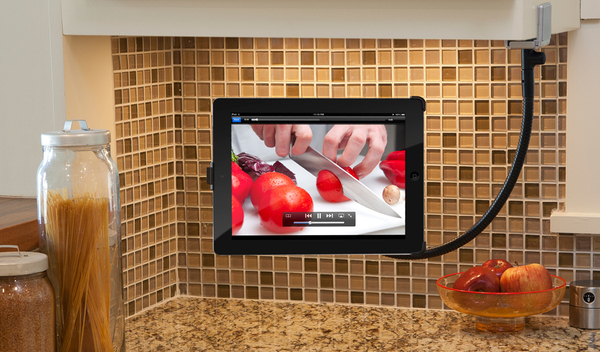 Pop open your favorite recipe or cooking app, or stream a how-to video while your iPad floats safely above the counter, away from splatters, spills and floury concoctions. Stand out, stand alone performer. Attach HoverBar to a table to create a mini, minimalistic workstation in a dorm or other small space. The sturdy, two-way clamp positions HoverBar upright so you can stand before it and jam with DJ and music apps, or launch a racing game and use HoverBar as a fixed steering wheel. HoverBar is useful in so many ways, we can't wait to see how it fits into your world. Elevates your Mac to a multi-computer. Why wait for your favorite apps to come to your Mac? Use HoverBar to bring apps to your Mac. With HoverBar floating iPad next to your Mac, you can stream Pandora from their super cool iPad app, while you tackle an iMovie project on 27-inch, wide-screen iMac. While your Mac is running a Keynote show, your iPad can be powering your go-to smaller screen apps.